NewCloud’s Frankfurt Hub, operated by Interxion, features unrivaled connectivity throughout Europe. This Frankfurt location to many is considered the heart of Europe’s digital economy. Known for housing thriving cloud, digital media, and finance organizations, this data center is a perfect colocation for any business looking to reach customers and clients throughout Europe, including Central and Eastern Europe. Germany is a country known for great economic strength and stability and Frankfurt leads the way in terms of digital innovation and cloud services. More importantly, the NewCloud Frankfurt Hub allows NewCloud services to reach international customers while also maintaining its core value proposition – ultra low latency and maximum up-time. Additionally, with only 150 miles separating it from the Düsseldorf campus (another NewCloud Hub), the two complement one another when it comes to backup and disaster recovery services in order to get data offiste and create redundancy. The Interxion Data Center sets numerous industry standards related to data center design, management, reliability, security, efficiency, and performance. With access to more than 600 carriers, you will be able to meet your clients and customers where they do business. The data center also features 5 layers of physical security, environmentally friendly energy options, and operational excellency. NewCloud’s Frankfurt Hub is strategically located and home to the core infrastructure of DE-CIX, Europe’s largest internet exchange. 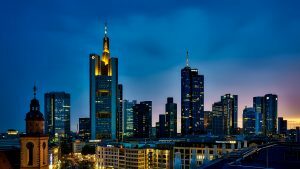 With direct cloud access, 99.999% availability SLA and 24×7 support, customers choose Frankfurt for its superior connectivity and gateway to Europe.